Sage and rosemary will fill your home with the smell of home cooking. Serve this tasty chicken with oven roasted vegetables for the perfect Autumn meal. If some of the vegetables are hard to find because they are not in season, go ahead and substitute a suitable one that is in season. 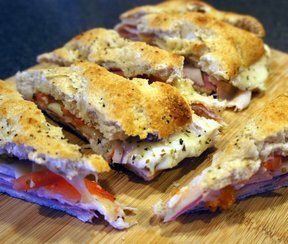 Warm sandwich filled with flavor. 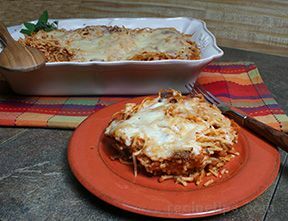 The Italian seasoning adds just the right touch to the tomatoes and melted cheese. This is the perfect sandwich beside a bowl of soup. This creamy dressing with the vegetables and chicken mixed together with crunchy shoestring potatoes is perfect atop lettuce or served on fresh bread. 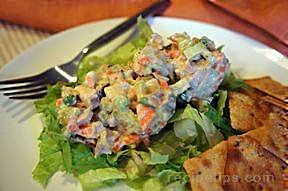 Try this recipe for lunch or a light summer supper. Another great way to enjoy that great taco flavor. 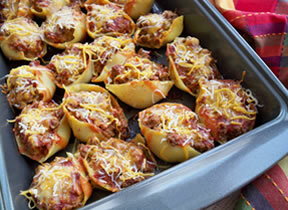 These taco-filled pasta shells are full of flavor and simple to make. 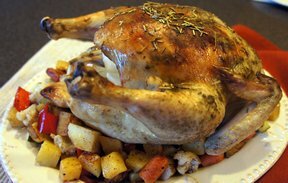 They make a great weeknight meal when you don't have a lot of time to fuss over dinner. Make this a week night favorite at your house. Crescent rolls and swiss cheese wrapped around a tender chicken breast. This is baked in a thick and creamy soup mixture to perfect it. Similar to chicken and dumplings but all bundled up. A simple slow cooker recipe that produces tender roast beef that is loaded with flavor. 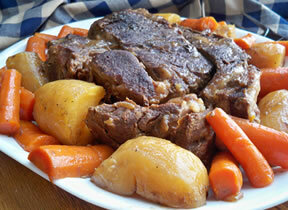 You will love the added bonus of the extra flavorful vegetables that are cooked along with the beef roast.